UCL has plans to build a new campus in Stratford – on top of 318 families’ homes. Stratford already has one of London’s highest waiting lists for a council house – with an average of ten years for a two bedroom flat. UCL is only fuelling this already serious housing crisis, not to mention destroying an entire community and potentially setting an example for other institutions to do the same. 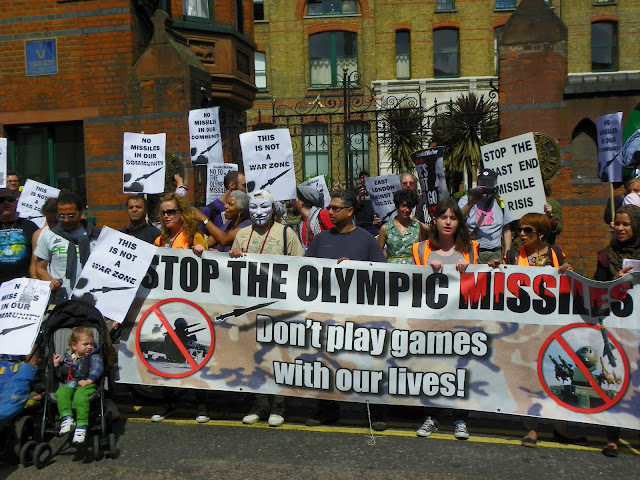 The Counter Olympics Network will be holding its next meeting at the London Action Resource Centre, 62 Fieldgate Street, London E1 1ES on Monday 12th November at 7pm. Sunday 4th November – Save Leyton Marsh will be hosting a ‘Marshes Unite’ strategy day for all individuals and groups to discuss protecting the future of the marshes long-term. from 1.00 – 4.00 p.m.
Getting there: The Mill is very close to Blackhorse Road and St. James Street, at the eastern end of Coppermill Lane. St. James Street Station (national rail) on the Chingford – Liverpool Street line (via Hackney Downs and Clapton) is about a two-minute walk away. The Victoria underground line and the Barking – Gospel Oak Line (London Over-ground, between South Tottenham and Queen’s Road Walthamstow stations) serve Blackhorse Road station, which is about a nine-minute walk away from The Mill. Walthamstow Central station (Victoria line) is about a fifteen-minute walk away. Bus W12 – only every half-hour, no timetables available – runs from Walthamstow Central bus station via the High Street (market) and stops on request outside The Mill. Buses 230 and W15 run between Blackhorse Road and Walthamstow Central stations via St. James Street. Bus 158 runs between Blackhorse Road station and Stratford via St James Street station, Markhouse Road (which crosses Lea Bridge Road) and Church Road Leyton. Bus 58 runs from Walthamstow Central bus station to Leyton via Markhouse Road – nearest stop is about a five-minute walk away from Coppermill Lane. Food & refreshments will be provided. Invite your friends & lecturers! 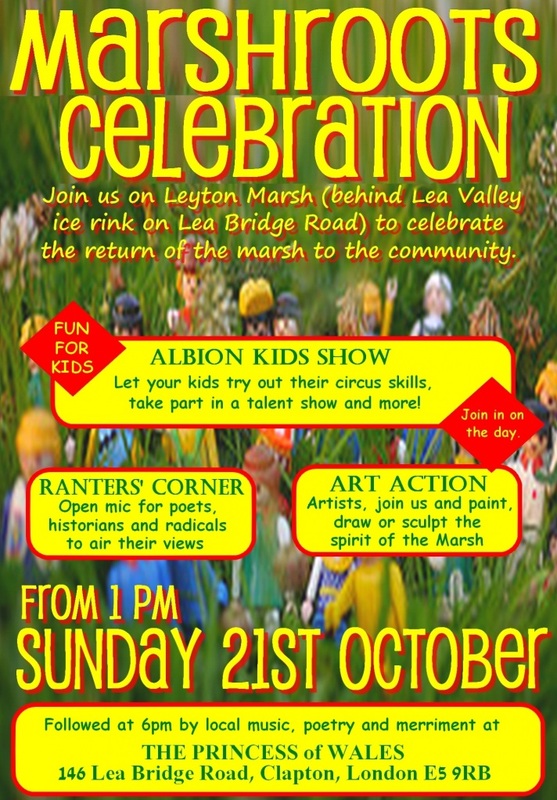 Sunday 21st October – Marshroots Celebration: Reclamation of Leyton Marsh. We will be celebrating the return of Leyton Marsh to the people who have fought so hard for it! This will be a joyous family event to also celebrate the end of the punitive injunctions ruled against the people in order for the unwanted monstrosity to be built. We will have the Albion Kids’ Show – circus skills and a talent show for children of all ages; Art Action – artists and amateurs to join us for painting, sculpting and drawing the spirit of the marsh; and Ranters’ Corner – an open mic stage for poets, radicals and historians to air their views. Next CON meeting Saturday 22nd September, 3 p.m.
Saturday 22nd September, 3 p.m – 6 p.m. In the face of considerable hostility, CON ran a very successful campaign, which helped to fight against many different aspects of the Olympics and Paralympics. In the process we drew together groups and individuals with varying interests and political perspectives, and helped put the issues on the map. * Legacy, what legacy? Here in London, we have been told that there will be substantial legacy. Even people who believed in it before can see that the promises are already crumbling. Some members of CON want to prioritise monitoring and campaigning around legacy issues, sometimes with local groups and sometimes with other interest groups. * ICON – the International Counter Olympic Network. Even though the Games have now left London, it is an ongoing concern that most of the problems that afflicted us will also affect the places that will be hosting future Winter Olympics, Summer Olympics and Paralympics, and the now being widely promoted Youth Olympics. We envisage that ICON will grow from the work that we have already done in London, and will focus on campaigning around the multinational companies who are majorly involved with the Olympics as sponsors and suppliers, doing research into the IOC and other transnational issues, and providing a focus for groups who have already been saddled with Olympics or who want to campaign against them coming. 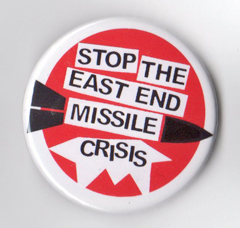 We intend that next Saturday’s meeting will consist of brief presentations about both these strands, and we hope that we can also hear updates from any groups and individuals who would like to fill us in about ongoing campaigning they are already doing or they would like to move forward with. NO LIMOS! NO LOGOS! NO LAUNCHERS! Assemble Mile End Park, East London. Solidarity T-shirts! Sold in support of the Save Leyton Marsh Campaign. Different colours and sizes. Contact us if you would like some/one. 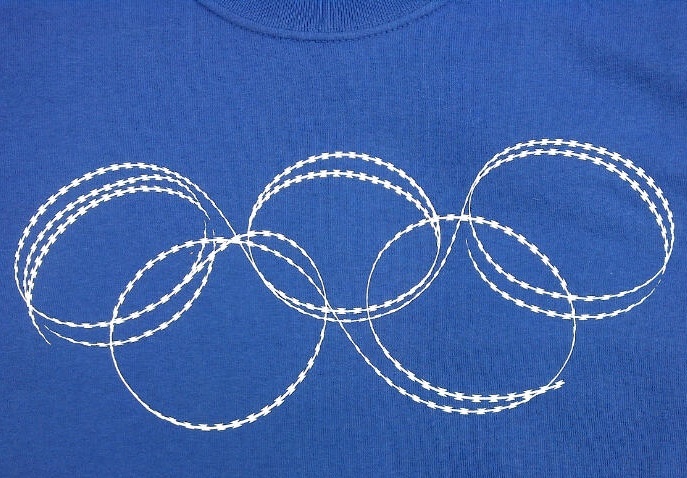 From the Anti-Olympics poster competition! July 28th Counter Olympics March in Bow! Counter Olympics Torch Relay – Second Leg – A Beautiful Day!